Leave Anchorage by train following the shoreline of Turnagain Arm where beluga whales feed on small fish and salmon head to spawning grounds. This area is part of the Chugach National Forest the—second-largest National Forest in the U.S. You’ll pass Girdwood then into the port of Whittier, passing through two tunnels. Whittier is the gateway to Prince William Sound and its magnificent glaciers. The train continues south down the Placer Valley leaving the highway behind and heading into an area only accessible by train. You’ll stop at Spencer Glacier among habitat populated by bear, moose, coyotes and wolves. 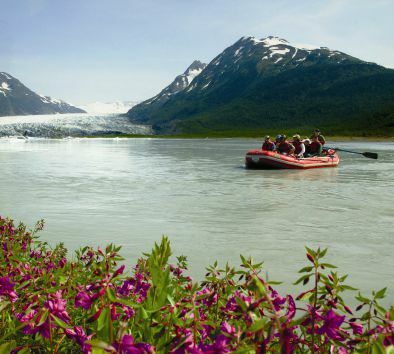 Your adventure operates under permit from the Chugach National Forest and your professional guide will meet you while on the train before you disembark at Spencer. Then, you will begin your raft trip on Spencer Lake formed by Spencer Glacier. Float among the icebergs as your guide explains the natural history of the area. The trip ends with a gentle raft trip down the Placer River where you will meet up with the Alaska Railroad for your trip back to Portage. You will then board a deluxe motor coach for the transfer back to Anchorage. Minimum age is 5. Dress in warm layers. Bring a raincoat. A light snack and bottled water will be provided at Spencer Lake. Additional snacks and beverages available for purchase onboard the train (at own expense). Travel time is approximately 1½ hour each way.